An individual quilt block can take on a vast variety of designs, colors, and textures to bring unique personality to any quilt design. Cultivate your creative insight for your next quilt block by checking out 200 Blocks from Quiltmaker Magazine Original Patterns from Today's Top Designers. Within this invaluable quilting book, you will find everything from Christmas quilt block patterns, square in a square quilt block designs, to applique block instructions. After flipping through just a few of these amazing quilt blocks, you will be amazed at how such a simple quilt technique can be adapted into a multiplicity of patterns. No matter your skill level, this book's collection of highly precise quilt block instructions allows you to try your hand at patterns such as simple patchwork, dainty English paper piecing, and professional-looking hand applique and embroidery. With whimsical pattern names such as "Rose Twirls" and "Spectrum Square", you'll quickly see that this collection of 12" blocks contains both traditional and contemporary quilt block patterns. If you're interested in making holiday-inspired quilt block patterns, this book also includes fun designs for patriotic quilt patterns, Christmas quilt blocks, and great seasonal block designs for every month of the year. 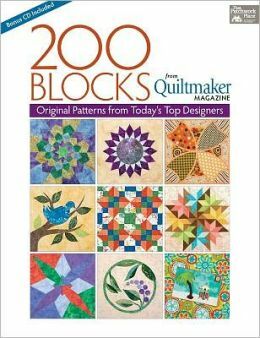 In my opinion, 200 Blocks from Quiltmaker Magazine really stands out amongst other quilting books because of how easy it is to find a specific pattern. I especially liked how this book organized all 200 quilt block designs into four categories: applique blocks, pieced blocks, foundation-pieced blocks, and mixed-media blocks. In addition, you can quickly find quilting blocks by your favorite designers by searching the easy-to-read block index. As if this marvelous mix of techniques and patterns weren't enough, 200 Block from Quiltmaker Magazine also includes full-sized applique and foundation-piecing patterns on a bonus CD. Whether you pick up this quilting book in search of a specific pattern or in hopes of a fresh source of creative inspiration, you won't be disappointed by 200 Blocks from Quiltmaker Magazine. With such gorgeous patterns and clear instructions, the only problem you'll have is deciding which quilting block pattern to make first.